Two Methods. One solution. 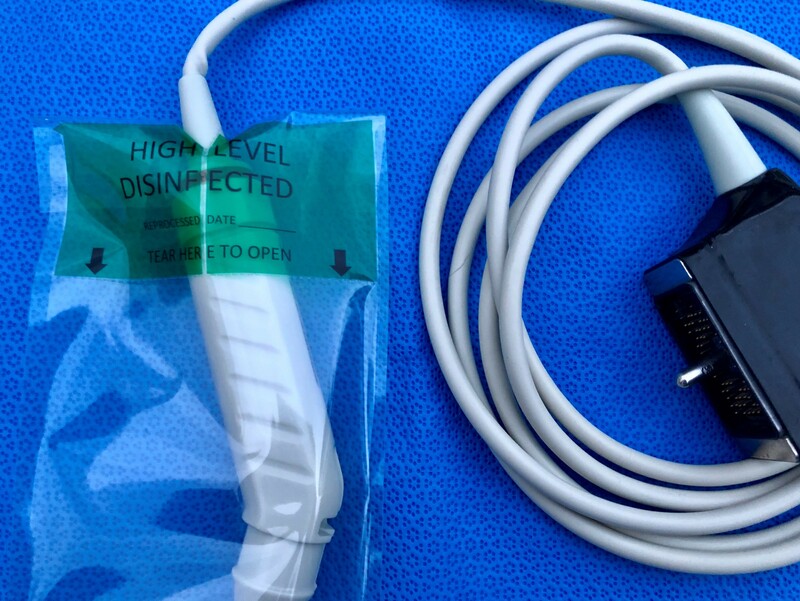 Ultrasound probes are high-level disinfected, but their cord is not. How do we keep those separated? Endo-cavity ultrasound probes, the kind that go inside a patient’s body and come in contact with the mucous membrane, such as transvaginal and rectal probes, are classified as semi-critical devices and require reprocessing through high-level disinfection, at a minimum. Then they must be packaged in a way to prevent recontamination. The Joint Commission, AAMI and the CDC are quite clear on this. Whether ultrasound probes are high-level disinfected through traditional soaking in a CIDEX OPA chemical solution, or through a Hydrogen Peroxide Mist machine, the cord, which attaches to the probe, is often low-level disinfected by use of a wipe, or occasionally by some other method. The cord is not of direct concern since it should only come in contact with the patient’s intact skin, if at all, however, if the cord contacts the reprocessed probe directly it can cross-contaminate the working end of the device making it potentially harmful to patients. Therefore, the probe and its cord must remain separated after reprocessing. This is best practice and common sense. If you think this is overkill, consider how many times a used (contaminated) endo-cavity probe comes in contact with its cord after a procedure during transport to reprocessing. You know where those probes have been and the diseases that can be transmitted through those areas of the body. Yes, the distal end of the probes is covered during procedures, and probes and cords are routinely wiped down after each procedure, but that process is often not held to a consistent measurable standard. Even when the cords are wiped well, once they come in contact with the reprocessed probe, it can be argued that the probe then presents a greater cross contamination risk to the patient. Inadvertent contact between the probe and its cord during transport and storage is avoidable, however. The keep-it-clean™ Ultrasound Probe Cover is designed specifically for ultrasound probes and features a custom flap which secures the probe and keeps the cord separate. The cover’s conspicuous tamper-evident green safety label must be removed to access the probe, ensuring the probe is ready for use on your next patient.